Gerard Robinson, a resident fellow at the American Enterprise Institute, has served as commissioner of education for Florida and secretary of education for Virginia. He also has been president of the Black Alliance for Educational Options, where he sought to ensure that children in low-income and working-class black families had the opportunity to attend high-quality schools. 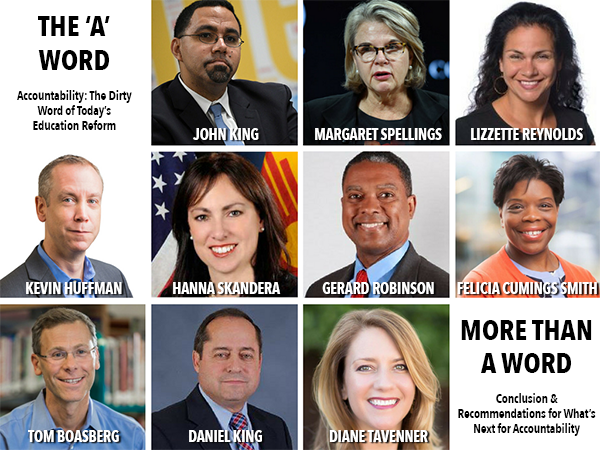 In these various roles, the Howard University graduate, who holds a masters of education degree from Harvard University, has evaluated how reform initiatives have impacted parental choice and student achievement. He also has advocated for laws to improve teaching and learning, and written widely about strategies and policies that provide all children a chance at a meaningful job and promising future. He began his career as a fifth-grade teacher. 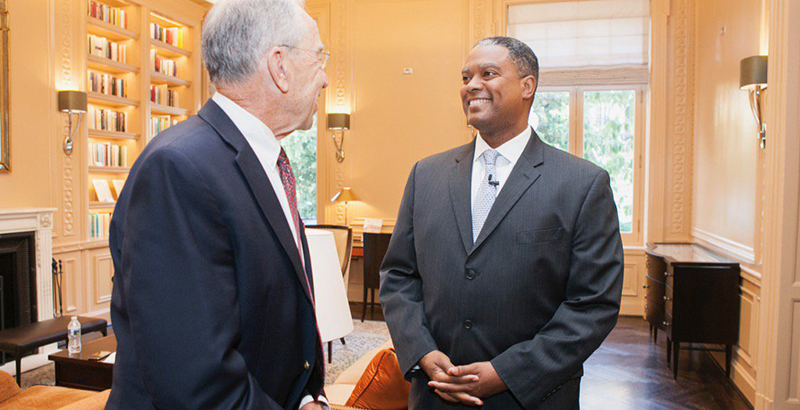 In this ‘A’ Word interview, Robinson explains how accountability mattered to him as a school administrator and a policy advocate. He believes that financial results and post-secondary remediation rates must be included in new definitions of school accountability. What’s more, he says, the term “accountability” has become too toxic. He advocates that those who support raising standards, assessing whether students are meeting them, and assigning consequences to the results come up with a new way of explaining those important concepts. How do you define accountability, and has that changed over time? Wearing my advocate hat, I define accountability as empowering parents to have a stronger voice in where they choose to send their children to school. I consider accountability to be holding schools, public and private, accountable for results, academic and otherwise. And I consider accountability to mean being responsible for the amount of money that we spend on schools. When I wear my administrator hat, accountability means something different. The first thing is adherence to statutes and regulations. I had to close a couple of private schools in Florida for financial malfeasance. I had to deny providing a charter to a number of schools. I had to close one charter school I authorized because, after a number of years, the leaders did not get the metrics they needed to me. As an administrator, I also had to be financially accountable. And I had to articulate to the public why we existed and how what we were doing is different than the neighboring school. What you didn’t hear from me in either set of answers was anything about test scores. What role, then, do test scores play in your definition of accountability? In Florida in 2011, we had a law on the books that said if a charter school receives an F in its first year, the local school board could close it. In Florida we only have a single authorizer, and that’s the school board. The state law allowed a charter petitioner to appeal its denial to the State Board of Education for review at that level. If need be, the state board can override the local authorizer’s denial, which it did most of the time. I took a look at the research. I also took a look at my own work as an authorizer and as a charter school founder. I spoke with one of the leaders in the Florida Senate and said, “You and I both know that the research is pretty clear, that it takes three to five years to see the benefits of a new program in place.” I told him that to require charter schools to close their first year is outside the aspects of research and not politically smart. Those schools are trying to educate children who did not do well in the traditional public school system in the first place. We worked out a new accountability measure that said that if you get an F in year one, you do not close. If you get an F or D in year two, you do not close. If you find yourself in the same position by year three, the State Board of Education could weigh in and decide whether or not it would close the school. Our purpose was to give a school time to show results, and because we want charter management organizations or education management organizations to come to the state to work with our hard-to-serve population. I can guarantee you are going to have an F in the first year, maybe the second, too. When KIPP opened up a school in Jacksonville, the school earned an F. By year three, it earned a B. I’m for grades, but I’m for having a stair-step approach to when we should integrate sanctions. Has your definition of accountability changed over time? Yes. I am more concerned now that we have the appropriate regulations in place for a law, not just the statutory language. In my former life as an advocate, I would throw confetti once the governor signed an education law. I thought my work was over. Once I got inside and began working with state agencies and saw the sausage-making, I realized that most state boards of education were making decisions every month about the scope and breadth of statutes we helped to put in place. Those decisions may have been outside of the reform reach that we on the advocacy side thought was going to occur. Frankly, we, the advocates, did not show up at state board of education meetings the way we had for legislative committee hearings. Making smart regulations means we do not have to keep amending the same law every session because we didn’t get something right the first time. I still believe test scores matter. I support school choice, but I do not think we should give parents the right to opt out of taking tests. If you decide to buy into a public school system, a charter school, or a private school voucher program where we have test requirements, you should take the tests. I support voucher students taking the state exam if they choose to and opening up the door for a menu of national norm-referenced tests as well. Give us an example of a policy that you thought was in the best interest of kids but faced significant opposition. I managed Florida’s application for No Child Left Behind waivers. I put together a commission focused on students with special needs and English language learners. It had come to my attention through research that the Florida accountability system did not include all the test scores for certain students with special needs and some English language learners. I put on the table that we’re going to include those students into our state formula. I got major pushback from superintendents who said my idea was well-meaning, but not realistic. Those superintendents had some students with severe special needs who typically do not come to campus, or teachers go out to their homes, or the students are doing things through multiple learning methods. The superintendents questioned why they should be held accountable for those students’ test or achievement scores. I understood what they were saying, because they would receive a sanction. But I responded that by making them responsible for all students, this was not a punishment as much as an incentive to make sure they were on par to support all their students. How do we re-engage the public to see that raising academic standards, testing students according to those standards, and having some consequences for the results, are important concepts? That’s tough. People will go for standards and testing. The question is sanctions. People will say that you are going to close my school, which the state will not do unless there are other problems at play. And if the state tries to reconstitute the campus, school or local stakeholders will say you are trying to privatize it. Whatever we do to change a school somehow turns into privatization and a corporate takeover. That’s one of the tough problems, and I don’t have an answer for you. I do think we need to get rid of the word “accountability.” It is too loaded, for the same reason that those in the abortion movement moved from “abortion” to “choice.” Or those in the gun movement moved the discussion from “gun rights” to “Second Amendment rights.” And in no way am I making a moral equivalency between school reform, abortion, and guns; rather, we cannot overlook how much language matters to a movement’s meaning. I do not have a word to replace “accountability” today, but we have got to get rid of the term. It’s simply too toxic. As you know, significant power is being shifted to states under the Every Student Succeeds Act. What should we now expect of our school board members, state legislators, state leaders, and district leaders when it comes to ensuring that all students have the opportunity to learn and succeed? One thing is it is going to be harder for state departments of education to blame D.C. for holding them back from doing things. Now, they cannot say that. That is important. Number two, one of the most powerful groups in school reform is going to be lobbyists and activists. I do not see that as a bad thing. You have more school reform groups in place today who could help state departments of education and school boards. Those groups are stronger now than they were in 2001 when we were looking at No Child Left Behind. The advocates are important. So are the consultants. A secure school board chair and superintendent should welcome the advocates and consultants because they have got a lot more in-depth knowledge about how this works. They can help [board chairs and superintendents] define accountability. That’s something good coming out of this shift of power. It could help school boards, state boards, and state chiefs. It would have a statistically justifiable link between what teachers are teaching and the state’s actual standards. We would provide that to students, and take a look at student results over a three-year period to see the impact. I support third-grade retention for reading. An accountability system would have that in place as well. And it would have mandatory summer school for math or reading, if necessary. It would not be for the entire summer, but intensive work for maybe a couple of weeks. On the teacher side, I would start off with 30 percent of the evaluation linked to test scores. By year five, for those who stayed, 50 percent of the evaluation would be linked to test scores. I would have a stair-step. I would want to see the accountability system show how much money we spent per student over a five-year period. We do not know how much it costs to educate them. In my ideal accountability system, we would know how much it costs to educate a student in algebra, chemistry, physics, music, and other subjects. We would not just know how much we’re paying overall, but for individual subjects. Are you asking for a breakdown of all the cost centers across a district? Yes. I became much more aware of that need when I moved to Milwaukee to work at Marquette University. Part of my fellowship was to look at how a big urban school system tries to make sense of reform. I realized that 66 cents on every dollar was already accounted for by the union contract, some of which went to pensions. That meant the $0.34 left over was for everything else — books, transportation, etc. I don’t believe the public has any idea how much it costs to educate students. A perfect system also would mean that less than 15 percent of our high school graduates need remediation in college. A lot of what you’re talking about involves data. How did you use data in your role in Florida and Virginia? In Florida I found out that we spent $185 million annually on remediation. This was money spent in colleges for people whom we had told, “You’re college-ready.” Guess what? They were not. So I put together another commission. I involved both K-12 and higher-education stakeholders — many of whom said they never had been invited to the table with their K-12 peers. I thought that was astonishing. I took a look at a number of data points, from data for younger kids to SAT and ACT scores. We looked broadly to see what you would need to be college- or career-ready. Our research team linked data together to determine that, if you had a certain score, you could enroll in one of Florida’s colleges without the need for remediation. That is one way we used data that had not been done before. A lot of people had been comfortable spending $185 million for non-credit-bearing college courses. We weren’t. What uncomfortable truth in education have we been unwilling to address? One uncomfortable truth is that we believe that every student should go to college in order to prove that we, as a nation, have overcome our past when we said some kids should not go to college. I certainly think every child should not go to college to earn a four-year degree. Some should go to a postsecondary institution to earn a certificate, an associate degree, or licensure. I think going to a postsecondary institution should be a choice, not a mandate. At the same time, some students should go directly from high school to the workforce or elsewhere. As I have stated before, my job is to work hard to make sure our students are college- and career-ready, but I am OK if a student decides not to go to college. The second uncomfortable truth is that we do have a school-to-prison pipeline. Our society just calls it by different names.